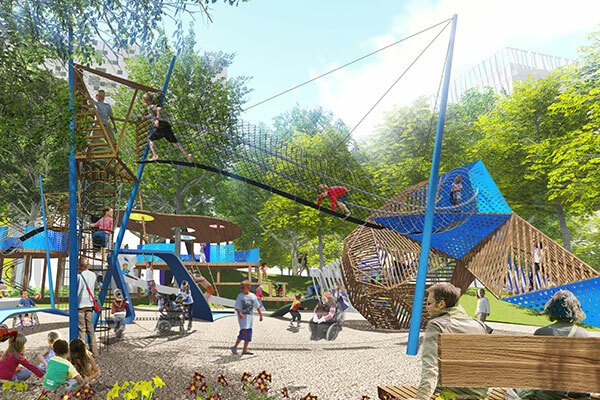 PFS Studio’s Grange Park team developed the concept for the new park playground adjacent to the Art Gallery of Ontario, in Toronto. The new playground which spans the entire eastern edge of the park displays structures inspired by the tools and supplies often found in an artist’s studio. A painter’s palette gives shape to a playful canopy over a tree house, a tipped over paint can creates a playful tunnel, and a climbing structure takes inspiration from crumpled up balls of paper. The playground structures are being custom built by Earthscape, an award winning design build firm in Ontario. “We’re always interested in conveying that it belongs there,” said principal Jennifer Nagai. “It makes it meaningful and gives it a sense of place.” For PFS Studio creating a playground to match its surroundings is central to the firms ethos. You can read more about the playground and see a animated tour here.